This model is charcoal grey and textured, though easy to grip and not rough. The buckle stud is already in place and can be unscrewed to remove. Solid metal. Weighs about 5 oz. 1/2 inch thick and very sturdy to last a lifetime. 4.5 inches long and 2.75 inches wide. Finger holes are about 1 inch front to back and a little less to the sides, maybe 7/8s. If using as a buckle, you may want to secure the belt stud with some super glue or epoxy. Also available is the lightweight version which is the same approximate size but weights about 3.5 oz. Note: We can only ship damascus knuckles to the billing address of the paying credit card, ie, dual address orders are not allowed. 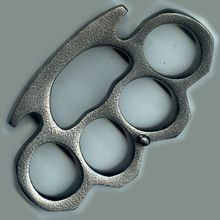 We cannot ship brass knuckles to FL,MA,MI,NY,DC,IL,RI or CA. If you are caught with these in your possession, you may get in trouble with the law.